Peterburg2.ru Portal has prepared an interview with Nikolai Matveyev, associate professor at the Higher School of Lighting Design at ITMO University and the Scientific Director of the International Lux Aeterna Theatre, the world’s only professional theater of a similar genre, now also a partner at the ITMO University in the field of drug-free medicine and research on stress management in the workplace. 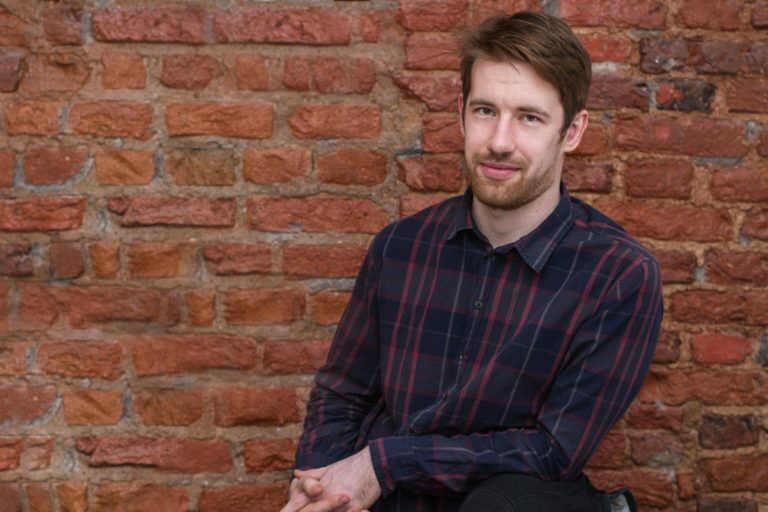 Nikolai Matveyev: For me Lux Aeterna Theatre it is a way to feel! Intro: Lux Aeterna Theater is the only professional theater in the world that has created its own original genre, style and method and was founded in 1982 by stage director and light artist Daniel A. Freedman. With the help of light and laser projection, as well as music, musical sounds, light artists are creating complex artistic surrounding, immersing viewers into a kind of non-gravitational space. 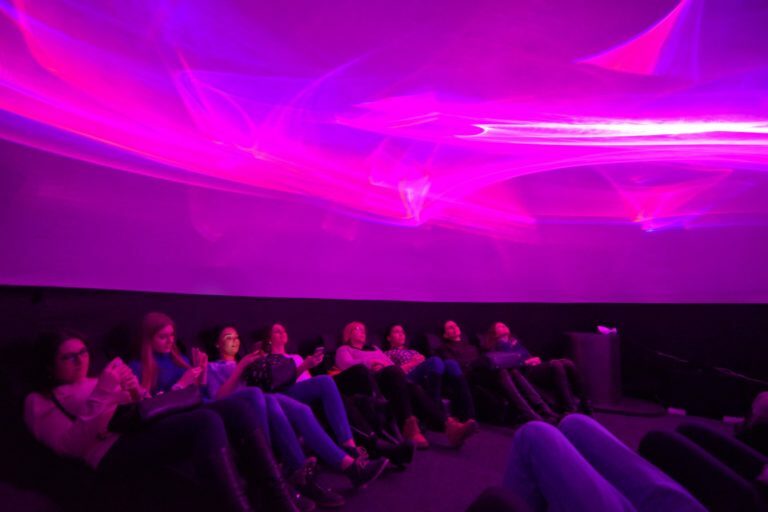 In the heart of Saint-Petersburg you can tear yourself away from everyday thoughts in the Tessarte Audio-Visual Center’s inflatable dome where Lux Aeterna Theater has been settled from the 1st of April. We are talking to Nikolai Matveyev, theater’s lighting artist, about unique laser-light-sound performances that are created on the verge of science and art. What is media art for you? Where does the border between art and technology pass, in your opinion? I spend most of my time studying science and technology. On the origin and concepts of media art I do not think much. I think the border lies in the soul of the artist-scientist. And depending on its impulses, we may get either one or the other. Why did you start studying laser theater? How did you come to this? 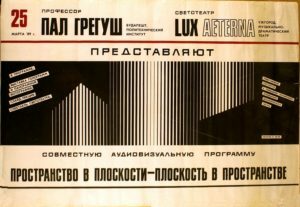 With the Lux Aeterna Theater I met in 2008 as a 5th year student at ITMO University, and was shocked by the emotional depth of the performance Without Gravity. Together with my fellow students we became a St. Petersburg troupe of the theater. For me Lux Aeterna is certainly a way of feeling. The laser theater Lux Aeterna in “Tessart” is not your first experience. Where have you already shown the laser theater in St. Petersburg? Has the theater changed since then? In 2009, we were giving performances on a regular basis under the 24 m dome of the Saint Petersburg Planetarium. 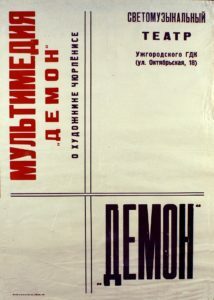 After the return of the theater’s director Daniel A. Freedman to Budapest, we continue to represent theater’s works at various festival venues, so for example in Kazan on the Singing Rainbow Conference and Festival, in Moscow at the festival of modern media at the WinZavod, at various venues in St. Petersburg, including the holography exhibition Magic of Light, VKontakte VK-Festival, were exhibited at Pushkin-10 Contemporary Art Center, as well as at the planetariums of Vienna, Rijeka and, of course, at different venues in Hungary and Austria (Universities, hospitals, Multiplex Cinema Centers, business incubators, Houses of Culture, etc.). We constantly strive to improve the technological basis of the theater, while maintaining its authenticity and remaining faithful to the principles of the harmonic well-balanced synthesis of Artistic Sound and Artistic Light. Every Saturday you arrange live performances in the Tessarte space. What awaits the audience for them? And what is shown in the theater at the usual time? During live performances we are introducing excerpts from the repertoire (plays, spectacles, shows, dramatics, relaxariums, etc.) of Lux Aeterna Theatre. In the main time we suggest visiting special relaxation seances based on theater performances. What is the main goal of the performances in the laser theater? Is it true that such a seance reduces the level of stress? The main goal of the orchestra of light and laser artists and sound designers is to give the viewer a feeling of non-gravity, immateriality. Diving into a special light-sound environment undoubtedly helps to distract from everyday problems. ITMO University together with medical universities carried out pilot studies that confirmed a decrease in the anxiety level of the participants in the experiments after the performances, based on the artistic content of the theater. It is these programs that you can visit at Tessarte Audio-Visual Center. In the future, we plan to expand the research to answer questions about the optimal duration, regularity of seances to achieve the best indicators of stress reduction. How are the performances created? What is at their basis? Is it always an improvisation or a pre-designated plot? Sometimes we organize improvisational performances together with live performances from music bands, but the repertoire performances performed live are the painstaking work of the art director, art directors and theater engineers, as well as many hours of rehearsals for light artists. Tell us about the music that is used in the performances. How do you choose it? What role does it play? The artistic director of the theater is engaged in selecting the musical material and creating the basics of light-score. The Sound under the importance stands on a par with the Light, I may say more – they are a pair, they are one. 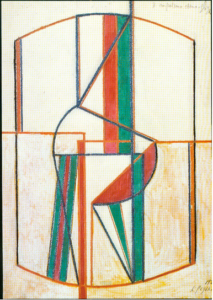 Back in 1923, the avant-gardist painter Kliment Redyko called one of his canvases To the construction of LightSound. In fact, he predicted the appearance of our Lux Aeterna Theatre, which was created almost sixty years later. Do you plan any other projects in conjunction with the Tessarte space? We plan to expand the repertoire, there will probably be live improvisations. Also we plan a laser painting exhibition and lectures of the artistic director of the Theater Daniel A. Freedman on Non-Gravitational Art. A Painter-prophet. 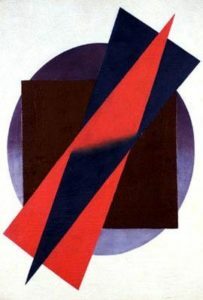 A “prototype” of modern light and sound theatre in the painting of a Ukrainian avant-gardist. Kliment Redyko is a painter and avant-gardist who ninety years ago foresaw a new art, a new theatre – thinks Daniel A. Freedman. 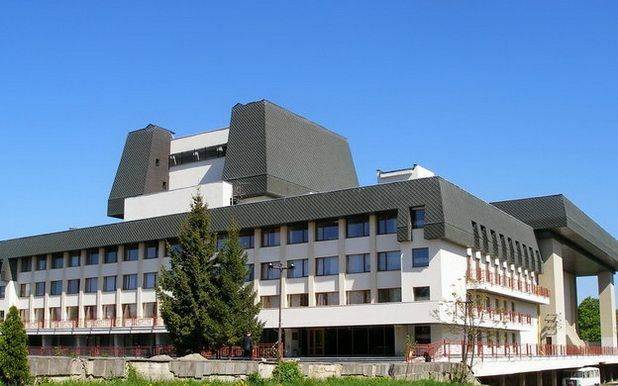 State Music and Drama Theatre, built in 1987 in the town of Uzhgorod, the Transcarpathian regional capital. 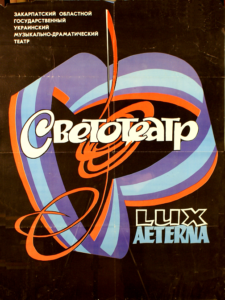 Between 1987-90 Lux Aeterna worked in the building of Theatre Music and Drama Theatre by the initiative of the Director Vasily Rusnak. Lux Aeterna team has implemented a significant reconstruction of the scene, has created a unique lighting-well and with professional large size rear screen. Laser-stage and light-stage complexes at that time had the widest opportunities to create of theatrical sceneries for the dramatic, musical, opera performances as well large size laser art-works, laser-visuals. The Space in a Plane – the Plane in a Space Stage Light and Sound Happening. World theatrical premiere of the 360-degrees PAL lens. Joint Stage Audio-Visual by Prof. Pal Greguss, biophysicist and Lux Aaeterna Theatre. Technical consultant and interpreter: Prof. Sándor Kökényesi, physicist, Uzhgorod State University. 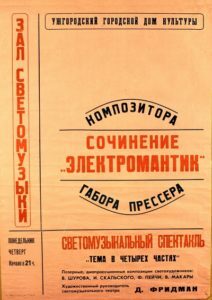 Uzhgorod, 1989, Music and Drama Theatre, Soviet Union. The first night of the new staging by the Lux Aeterna Theater and the Theater of Voice can be described as unique and unexpected. On June 2 and 3 Kyiv residents had a chance to see and hear the Sound of Magic show in the Kyiv Planetarium. Its creators united vocal and visual artworks in a continuous show, in which both elements created a unique magical atmosphere. The idea of staging turned out to be successful thanks to the fact that each theater troupe is a creative union that has no analogues in Ukraine. The Voice Theater created by the famous vocal band DUO Zikr, consisting of Olha Tkachenko and Ihor Silin, masters the widest range of vocal techniques, among which are classic vocal, Slavic song traditions and Eastern throat singing. Incidentally, Silin’s theatrical work as director and Olha’s work as an actress preceded their joint career as a vocal unit. They worked together for a number of years in St. Petersburg as DUO Zikr, went on tour in many western and eastern countries and released 17 albums, which is the sign of their complete success. Their next step was a return to Kyiv and creation of the Voice Theater, which unites 12 performers – graduates of the Tchaikovsky National Music Academy, the Karpenko-Kariy Theater and Cinema State University. The creative work of the Lux Aeterna Theater headed by Daniel Freedman is an absolutely live process and has nothing in common with the omnipresent computer effects, to which the contemporary audience has grown so accustomed. The theater has existed for more than 20 years, while the idea of its creation is even older. Its permanent stage is a unique hall in the planetarium. Under the cupola an array of colored rays flow, unite and interlace with each other thanks to special technical effects. Experts agree that there is no analogue of this system anywhere else in the world. The Sound of Magic exhibition offers audiences the chance to enjoy a unique world of sounds and visual images that are reminiscent of mysterious ancient civilizations and distant Eastern cultures. Voice vibrations and the aura of general reflections make beholders think that magic is real (Kyiv Weekly, Oleksandr Marynych). 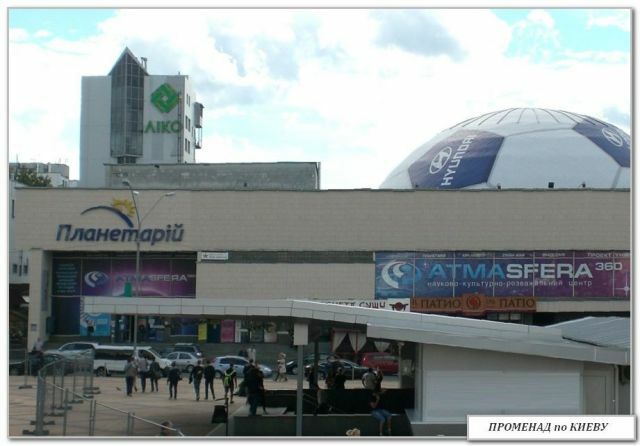 Lux Aeterna Theater in Kiev, Kiev Planetarium’s 23 m huge dome. The very first in 30-year history of the Kiev planetarium full-dome light and laser projection made by Lux Aeterna Orchestra.